Fishing is supposed to be fun and exciting, and it definitely is when something’s on the hook. But when you’re sitting there, hour after hour and nothing is biting, you start to get a little bored. If you actually want to fish and not just be on a boat, then it’s time to pick up a fish finder. 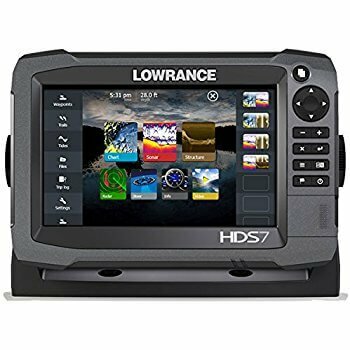 Today we are looking at the Lowrance HDS 7, one of the best fish finders at this affordable price point. It comes with all the features you need, along with a few special extra that you’re sure to love. Let’s review it and see why this unit fits the bill. 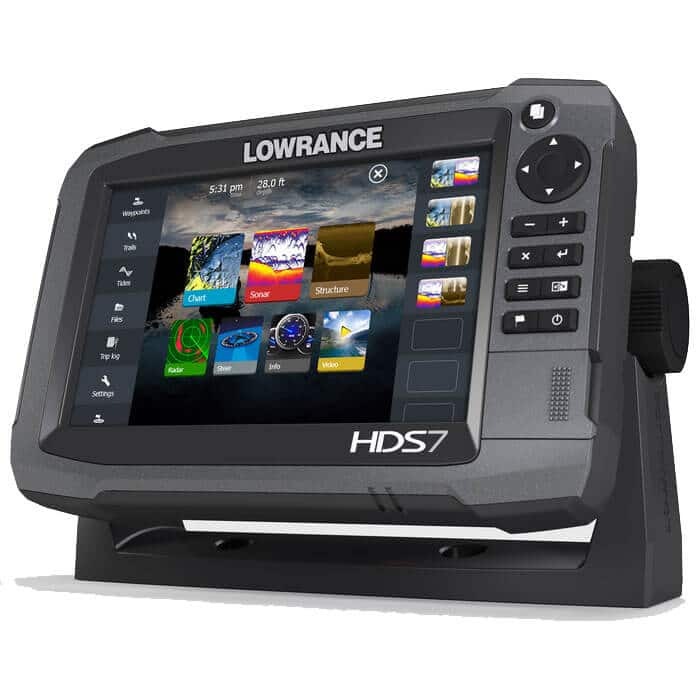 As the name suggests, the HDS 7 has a 7-inch screen, which is one of the more common and popular in this arena as it’s big enough without being too big. The resolution is 480-by-800 pixels (again, quite common), and it uses WVGA color and LCD backlighting up to 1,200 nits to keep the screen bright and well-lit throughout both the day and night. You’ll have absolutely no problem viewing the sonar scans with high suns or no moon. The display and unit itself are waterproof and well-balanced, ensuring that it looks aesthetically pleasing while also being very functional. One unique thing about this fish finder is that features both touch controls on the display itself along with buttons on the right-hand side. Most units only have one or the other. This allows you to use touch functionality when it’s warm, and the buttons if it’s cold and you have gloves or your hands are wet. Despite having a ton of features, you can easily access all of them within a few seconds. You shouldn’t have to dig too deeply to find what you’re looking for, so even newcomers can quickly grasp how to use and read the data. Not only that, but you can display up to three screens at once to show different types of imaging. A GPS is a wonderful thing to have, even if you’re treading familiar waters. Aside from helping you navigate from point A to point B, this GPS has a few extra tricks up its sleeve. First of all, let’s talk about routes and waypoints. You can program up to 200 routes here, which is more than similar fish finders. You can also program up to 5,000 waypoints. Waypoints are great because you can mark locations where you found lots of fish or anything else interesting. You also gain access to the “GoFree” feature with the HDS 7. This is a cloud-enabled feature that allows you to download maps from nearby users. So, whether you’re fishing with other boats or want to swap information with friends, this allows you to instantly download maps to help you find the best fishing spots. The GPS doesn’t have the same functionality as commercial fish finders used by large-scale commercial fishermen (which are good for spotting hazards and sweeping large areas), but that’s to be expected at this price point. In this arena, it offers one of the better GPS features. There is only one wire required for this fish finder, and that’s for power. Everything else, from communicating with transducers to receiving software updates and new maps, is handled through Bluetooth and wireless connectivity. This makes it so easy to keep your device up to date, which is more important than most users realize. Updates are there to ensure that maps are right, that features run as smoothly as possible and they correct bugs that may be lurking in the background. Unlike most fish finders that must be plugged into a computer to receive an update, this can be done right from the open waters. Using SD memory cards allows you to save more routes and data, which you’ll need after logging many hours out on the water. The device itself comes with internal memory of 7.8GB, which is good to start with, but you’ll definitely want more. You can also use two microSD cards simultaneously up to 32GB of data. It’s very easy to swap out and put new cards in there, ensuring that you can keep the storage as open as possible for new data. CHIRP imaging is a type of technology that uses several frequencies simultaneously to produce the clearest result. Normally only one frequency is used, but this revolutionary technology (first developed by the military, but now used with fish finders and similar sonar units) used multiple frequencies at once and then shows the best image, ensuring that you have an easier time seeing what’s around your boat. This comes standard with the Lowrance HDS, and you’ll immediately notice the difference when you see how clear the readings are. You can also use CHIRP with StructureScan for a clearer underwater image that covers the whole area around your boat (explained more below). If you’ve been looking through fish finders, then you might find these terms a little confusing. Other brands often use the terms side imaging and down imaging respectively. Regardless, these imaging types are amazing and work in complementary fashion to help you find the best fishing spots. StructureScan (side imaging) works by increasing the scan range around the boat, showing you what’s around both the left and right sides. This gives you a 180-degree plane of vision to see if you’re in a good area or not. Nothing is more frustrating than just missing a good fish to your side. DownScan (down imaging) is exactly the opposite. Instead of focusing on increasing range and distance, this is focused on clarity. It gives you a very clear POV under the water, allowing you to see exactly what’s going on down there. You’ll easily be able to make out objects to see if they are fish or anything else. The power of this unit is fairly standard, starting at a regular operating power of 500W and 4,000W peak-to-peak. Frequencies for the StructureScan are 455 to 800kHz, CHIRP ranges from 40-60kHz, 85-145kHz and 130-210kHz. You also have access to 50, 83 and 200kHz frequencies. Depth is around 1,000 feet in general, which should be more than adequate for most fishing trips. This will give you a very good idea of what’s swimming around you while giving you plenty of frequencies to play around with. 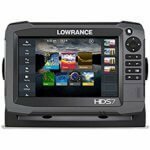 The Lowrance HDS 7 is one of the best affordable fish finders available. Aside from giving you all the features you absolutely need to find great fishing spots, it also has wireless connectivity, several types of imaging, both touchscreen and button functionality and the GoFree feature that enables you to download and share maps with nearby users. Whether you’re an amateur or professional, the HDS 7 will definitely serve your needs quite well. You’ll find that this fish finder is a top-tier offering in this category that gets the job done while also giving you plenty of tools and functions to play around with.